The results are in and Iced Matcha Latte has been the favorite drink during these hot summer months at the tea house. So what is matcha? How is it made? Why is it popping up on every coffee shop menu (including Starbucks!)? And why should you try it if that bright green facade has been a turn off. The quick and dirty of it is matcha is a powdered Japanese green tea. Rather than brewing and removing it from the hot water to drink, you actually whisk the powder into the water and consume the whole leaf. Matcha is the center piece in Japanese tea ceremonies and has a centuries-old ritual and tradition surrounding it. In this modern age, matcha has found its way into lattes, shots, baked goods, ice cream, pudding, chocolate, pretty much anything and everything you can consume. So what's so special about matcha? Let's dig in and find out! Shading the tea plant prior to harvest. Like previously mentioned, matcha is a Japanese green tea, more specifically a stone ground Japanese green tea. The appearance of matcha is the first thing you notice that sets it apart from other teas but matcha really begins in the tea garden, before the leaves are harvested. Special tea plant cultivars are grown to produce matcha, some common ones are Samidori, Yabukita, and Okumidori. Most matcha production in Japan occurs near Uji in the Kyoto Prefecture in the southern region of the main Japanese island. There you will find large tea gardens blanketing the hills where the tea plants are grown in long rows similar to grape vines. Harvesting begins in the early spring but before the leaves are plucked a very important step must happen, the plants get shaded prior to harvest. The tea garden will get cloaked in either black plastic shades or traditional straw shades. The duration of the shading is determined by the final grade of the matcha, in order to be classified Ceremonial Grade, the plants must be shaded for a minimum of twenty days prior to harvest. When the plants are shaded, the amount of light getting to the plant is significantly decreased. This decrease in light then causes the plant to boost its chlorophyll production and some other crucial flavor chemicals in the leaf. This increase in the level of chlorophyll is responsible for the vibrant, rich green color of high quality matcha. When the plant has been shaded long enough, the leaves are then harvested. The specific pluck (the combination of bud and leaves that are harvested) is determined by many factors including the pliability of the leaf and the specific grade of the matcha. Typically, the bud and two leaves down is harvested. Tencha, matcha before it's stone ground into a fine powder. Small stone mill for making matcha. The harvested leaves are then steamed to stop the oxidation process (the same process that turns a cut apple brown). Next, the steamed leaves are dried and sorted. The sorting process will separate leaves and buds into groupings for different grade teas with the buds and newest leaves being the highest grade. After sorting, the leaves are deveined and de-stemmed to make the final product before grinding, tencha. At this point, you could steep the tencha like any other green tea and it would make an excellent cup. To really take it over the top though and turn it into matcha, the tencha is then stone ground into a very fine powder to create what we know as matcha. This grinding process is very crucial and can turn a good matcha into a not so good matcha. A high quality matcha is stone ground while a low quality matcha or green tea powder is ground with metal grinders. Stone grinding is a superior method for turning the tencha into matcha because the stone helps to prevent the matcha from heating up too much which degrades the bright green color that was created during the shading process. The speed of the grinding is also crucial in determining the final quality of the matcha. The slower the grind, the finer the resulting particles which create a smoother, more delicious cup. An array of matcha bowls, chasen. Matcha is prepared very differently than any other type of loose leaf tea. There are specialized tools involved and brewing parameters. Unlike other teas, the leaf is not traditionally brewed and then removed from the water for consumption. Matcha is actually whisked into the water and served without discarding the brewed leaf. To make the perfect cup of matcha you will need a chawan, the bowl you whisk the matcha and water together in, a chasen, the bamboo whisk, and sifter. There are some additional specialized tools including a bamboo "spoon" and ladle but you can get by without those items. You first want to sift a single serving of matcha into the chawan and then add a small amount of water, about an ounce, to the bowl. The water should be at a temperature much lower than boiling, more like 170 degrees. Using the chasen, you blend the matcha and water into a paste. This preparation is called koicha, which translates to thick tea. The consumption of koicha is reserved for the highest quality matcha. 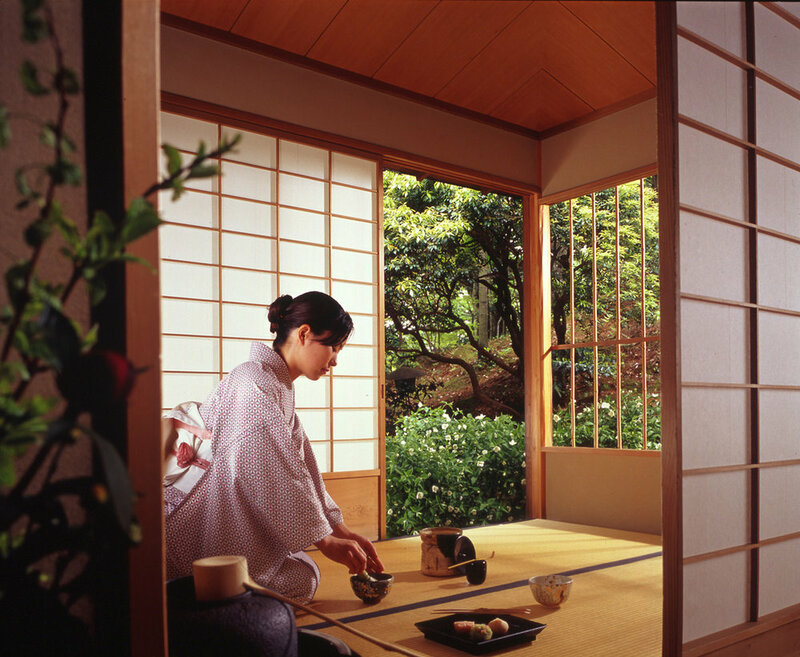 During a Japanese tea ceremony, it is customary to first share a bowl of koicha. For the next preparation, more water of the same temperature is added to the koicha and then, using the chasen, the koicha is mixed with the added water and the surface of the liquid is vigorously whisked in a "W" motion with small quick movements. This produces a very fine thick foam on the surface of the matcha which gives the drinker a very smooth and rich drinking experience. This preparation of matcha is called usucha, which translates to thin tea. Usucha is the more common form of matcha preparation. Japanese tea ceremony with matcha. In recent years, matcha popularity in the west has skyrocketed. Matcha is commonly consumed with milk and sweetener to create a matcha latte, hot or iced. You will also see matcha turned into baked goods and all sorts of other concoctions. Buying matcha at the grocery store can be a tricky proposition because of all these uses. If you're buying matcha to consume as koicha or usucha, you always want it to be designated as Ceremonial Grade. Steer clear of any matcha designated as cooking grade or called green tea powder, unless of course you plan on cooking with it. These powders will be very course and bitter and yellow or brown compared to a bright ceremonial grade. Not too appealing! Why Should You Drink Matcha? Well, anything green is good for you right? All joking aside, matcha is really a super star when it comes to its health benefits. It has at least seven times more antioxidants by weight than goji berries, it is the only known source of the powerful catechin EGCG, and it is rich in L-Theanine (the tea plant is the only known edible source of this amino acid) which boosts our body's ability to produce the GABA neurotransmitter and stimulate the release of dopamine and serotonin. The health benefits of matcha really are astounding and the amount of information out there on the subject is vast and deepening every day. But why consume it if only for the health benefits? Why do anything absent of joy and love and appreciation? Maybe these health benefits are the foundation of your love and appreciation of matcha, in that case I encourage you to continue researching all the remarkable health benefits. But if you want something more, consider the history, artistry, craftsmanship, tradition, and ritual that go into your cup of matcha. When I sit to prepare and appreciate of cup of matcha, I can see the lush mountains of the Kyoto region of Japan, I can feel the mist on my skin, and I can smell the fire burning from the iroris of the centuries-old homes lining the twisting narrow roads. This is why I love matcha, and all tea. It transports me to another land, somewhere steeped in history. The high and sense of well-being it gives me I can contribute to the chemical make-up of the leaf but I think that would fall short if it were not for the long history of care, intention, love, and joy that makes matcha what it is today.